You are currently browsing the category archive for the ‘meeting’ category. 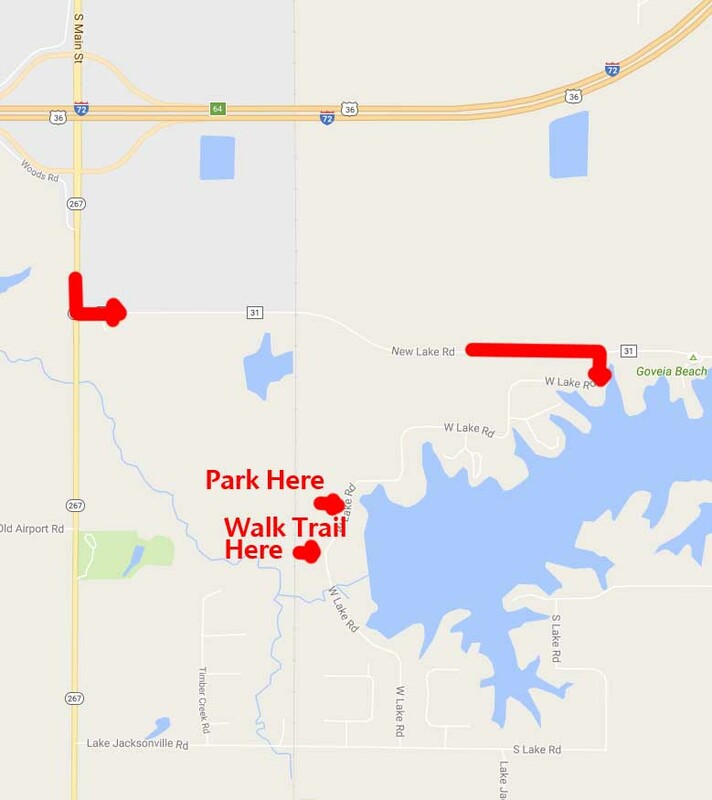 The Friends of the Trails of the Jacksonville Park Foundation invites the public to tour the spot for a planned walk/run/ride bridge at Lake Jacksonville. Volunteers will be on hand 5:30-6:30 Wednesday afternoon September 7 and 9-10 Saturday morning September 10 with plans for the bridge, and for a proposed bike transportation network. The final vote on the issue is expected at the city council meeting 6pm Monday September 12 (2nd floor City Hall). You can download lake plans via DropBox. The designed and funded bridge is at the old West Lake Road crossing of Big Sandy Creek. The bridge plus the existing road bed would create a half mile of traffic-free path for families to walk or ride bikes, and enable people to run or ride bikes around Lake Jacksonville without having to travel on IL 267. Mountain bikers who made trails at Mauvaisterre Lake are chomping at the bit to put in trails at Lake Jacksonville that won’t flood. Plus fishermen will have easier access to shoreline close to the dam. And campers on the south side of the lake will have an option to get to the concession area without using their vehicles. The area is city park land that you may visit at any time. Come during the tour time to get info, take a little walk in the woods to see the site for yourself and find out what you can do to make the bridge a reality. Use Facebook events for Wednesday and Saturday to spread the word. Or bring your dog and join in the simultaneous Dog Packs Wednesday and Saturday. Directions from Jacksonville — take 267 south, turn left on New Lake Road, after RR tracks and houses turn right on West Lake Road, go about 1 mile to parking lot. Download plans. See the city’s comprehensive plan for references to a bike path around the lake. (Develop a trail system in Jacksonville for multi-purpose use around Lake Jacksonville on p 191, search the PDF for “bike” for other references.) Send feedback on the plans below. Thanks to Shawn Artis for creating the proposed bike transportation plan outline maps. 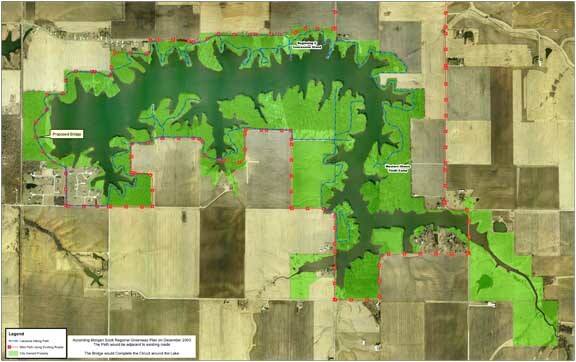 Map of lake showing public land and existing/old roads ripe to be made into trails. At the Jacksonville Main Street annual meeting today the organization unveiled a new vision for growing downtown — as a place to visit, live, work and play. The vision includes safety for pedestrians and a bike friendly environment to attract people downtown. As a place to live, downtown communities are a preferred location for retiring boomers and young professionals. Both of these demographic groups are attracted to areas that are pedestrian and bike friendly. As a place to play, designs that attract people on foot and on bike to visit downtown. Projects like a recreational trail along the Town Brook. Connecting to downtown, say, along Sandy Street with a pocket park where Illinois Power is removing their stream-side substation. 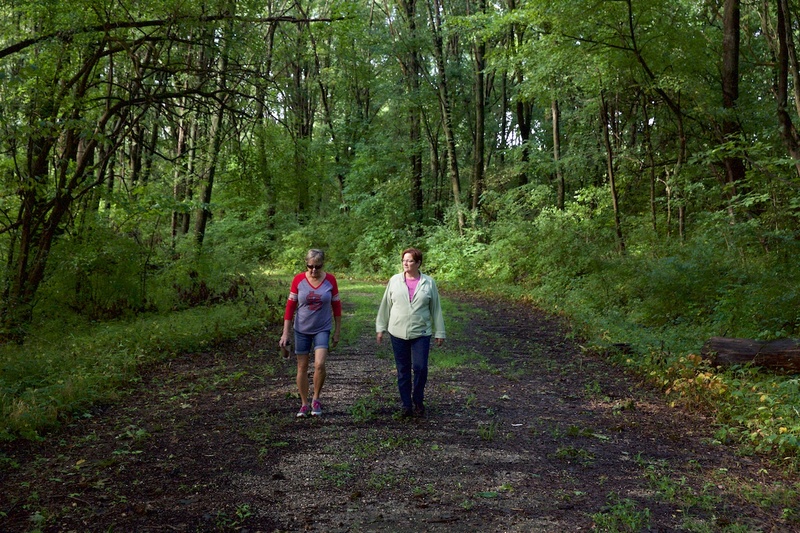 A parkway where people can transverse the city, from Foreman Grove/Pioneer Woods to Wal-Mart. A project that not only brings people downtown, but spreads revitalization energy out into the rest of the city. Projects like a bike route along State Street. Folks from Springfield can come in via Old State Road and cross a pedestrian/bicycle bridge (replacing the old State Street bridge). Traverse the city hitting sights like ISVI, Lonzeratti’s, MacMurray College, downtown, architecture on West State Street, Duncan Park, ISD, on Lafayette past Eisenhower School. West of town take Liberty Road and parallel the old Northern Cross Route (the first railroad west of the Alleghenies) to cross the river at Meredosia and to points west. The Town Brook Initiative of the Jacksonville Park Foundation seeks to work with community leaders and interested parties to plan these projects through local governments. The City of Jacksonville has set the date for the spring 2013 cleanup of the Town Brook for Saturday morning April 20th. This was one of the items covered in the city council’s Town Brook Special Studies Committee meeting this morning. Alderman Lori Large Oldenettel said the spring cleanup will follow the format of the fall cleanup. Work went from 8:30-11:30 am, folks met at the old Midland’s parking lot, had to be 18 or over to participate. Follow updates, developments and details on the our TownBrook.com community group’s Facebook page. Start spreading the date of April 20th (rain date April 27th). Completing the cleanup will get the city a $500 grant from the EPA’s SCALE fund (Streambank Cleanup & Lakeshore Enhancement). Until then, here’s a challenge for everyone — where does all the trash in the Town Brook come from? The late Roger Zulauf pushed for a park along the Town Brook, and would tell his students at Turner Junior High School “if it blows, it flows.” Meaning anything that blows around at Turner or along Morton ends up in the Town Brook. Take it upon yourself to try to find the sources of garbage that ends up in the creek. That way we can work with business owners and the city to try to find ways to cut the flow of trash. Other highlights from the meeting . . .
Mayor Andy Ezard will get the special studies committee in touch with the city’s new lobbyist, to see if he can help snag some grants/funds for development of the park along the Town Brook. 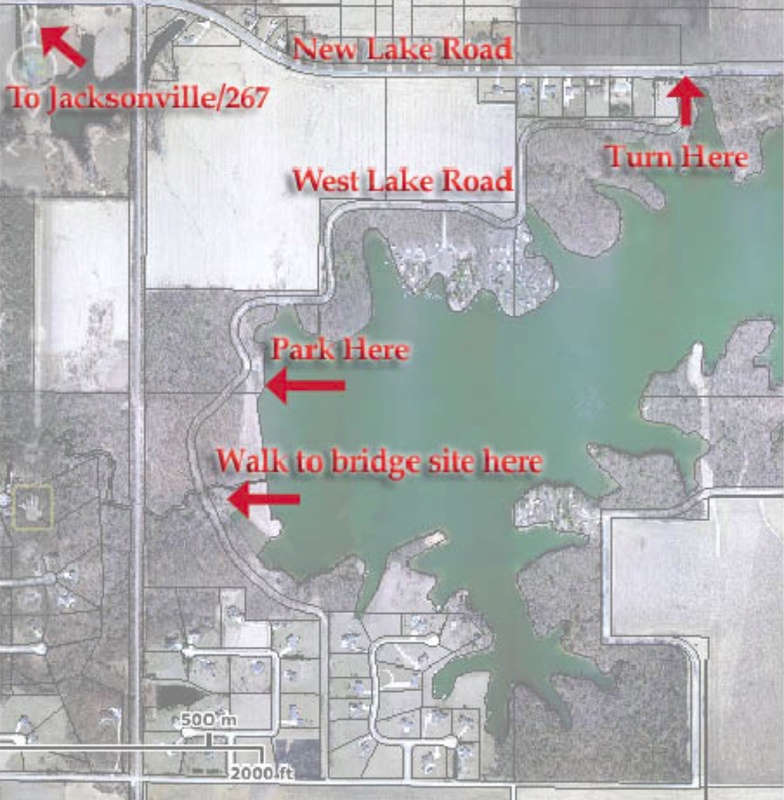 Bruce Surratt of the city’s parks & lakes department is working with the Illinois Department of Transportation to approve plans for putting up a pedestrian/bicyclist bridge below the Lake Jacksonville spillway. Once this is complete people will be able to safely get around the lake and better take advantage of the community’s major recreational spot. Farnsworth Group planners will be asked to meet with city officials and the public to give the results of the community input day. Tentative date is Monday May 13th at 5:30 pm (before the city council meeting). Alderman Lori Large Oldenettel registered the Town Brook for a State Farm $25,000 Neighborhood Assist Grant. If our community gets to the next stage of one of 200 projects nation-wide, starting April 4th people can vote on Facebook with the top 40 receiving grants. Get the Facebook App at www.statefarm.com/neighborhoodassist. Alderman Oldenettel also gave a report on last month’s Town Brook Improvement Project Community Input Day (see story). She reports good feedback from neighboring property owners, who pointed out the town brook is already used by local children and as a short-cut by pedestrians. She also said thinking outside the box will make it more likely for the community to get grants. So, beyond a park, think outdoor learning, place for community gardens, a way to fight childhood obesity. City Treasurer Ron Smiljanich reminds us “just one person can make a difference.” He’s been picking up trash along the Town Brook, and reminds everyone they can do the same, every day. Thanks to all those who care about the community who do this! Posted by Steve Warmowski. Follow us on Facebook. We had a great turnout Thursday 21 February 2013 for the Jacksonville Town Brook Improvement Project Community Input Day. Engineers said in other towns they’ve sat around for a day while two people stopped in. This time they had a steady stream of people from the community coming to give their input. Thanks for your support! Highlights are below. If you don’t see your idea, you still can be heard by emailing ideas @townbrook_com or call Lori Oldenettel 217.370.4597 before the end of the month by Thursday 2/28. Farnsworth Group will work with all the ideas and suggestions, and present a master plan the city can follow in the future. One of the best parts of the day was during the time for people who live next to the Town Brook. Two different families came, both expresses interest and excitement with the project. They hoped the project would address some of the flooding and maintenance along the Town Brook, and were receptive to the idea of public use of the land behind their homes. “People have walked there for years and enjoyed it.” So what we’re proposing with the Town Brook isn’t a radical new idea – it’s formalizing what already happens unofficially, and invites the whole community to take advantage of this community resource. Another highlight of the day was during the city official segment when Bruce Surratt of the city’s Parks & Lakes Department said he’s been fielding numerous phone calls from people who want to know when they’re going to be able to start using a path along the Town Brook. “Are we going to be able to ride along the Town Brook Path to get out to the lake to watch the 4th of July fireworks” Surratt reported one enthusiastic caller asked. It’s great to see how much excitement this project proposal is garnering in the community! To sum up the day, it looks like the anchor points of a Town Brook recreational path will start at Illinois College/YMCA and follow city land to MacMurray College. Along the brook add trees and put in wildflowers that grow knee-to-waist tall. A path along the brook at certain points would divert onto neighboring sidewalks or streets. There would be side paths off the Town Brook recreational path to pull in destinations such as the downtown Jacksonville, Washington School, Franklin School and Community Park. Focus also on improving the health and flow of the stream. The beginning and end points can later be extended to run to Wal-Mart and future development west of Jacksonville along the US 67 corridor, and connect with a bike route to Lake Jacksonville via Massey Lane and Airport Road; beyond MacMurray a bike route can run on Routt Street, connect to the Our Saviour School fields plus railroad land south of College and Foreman Grove. After that connect north along Mauvaisterre Creek to the north end of town, connect with Pioneer Woods and the Pioneer Heritage Foundation Zion Park off east State Street, pedestrian bridge at the Old State Road bridge gets people back on State Street east past the Gen. Grierson Home and back to MacMuarry College and downtown Jacksonville. Farnsworth Group will present an outline study to the city council sometime this spring. The city then needs to go ahead to Phase 3 which would be a more extensive study and planning. Please keep communicating with your city alderman your support of this project, and your support of funding Phase 3! The day was broken up into half-hour blocks set aside for different members of the community, such as city leaders, colleges, adjacent property owners and business. Lots of mention was made of trash (fast food bags, wrappers, napkins) blowing in off of Morton and into the Town Brook. Alderman Don Cook, who was part of the fall cleanup, said the section that his crew made spotless is now full of trash again. Challenges of enforcing littering laws is that you have to catch people tossing. Maybe a fence could be put in at the back of business to catch blowing trash. Also, as the Town Brook becomes a park, and a path, and people walk around and see trash with a big logo on it, it’ll come back to that business and they’ll take responsibility for their trash. Giving attention to the Town Brook will bring civic pride and involvement, that would encourage businesses to take steps to keep their trash out of the parkway. Illinois College’s Larry Zettler (city’s special studies committee) said the Town Brook is a great resource for educational opportuntities. Not just for science, but for all students. MacMurray College’s Nadine Szczepanski (also of the city’s study committee) said students from Mac as well can help plant native grasses and wildflowers and make for a beautiful and clean brook through town. Both college professors love the project. The brook can also have WiFi hotspots, allowing for outdoor labs and for on-site classes on the Town Brook. City should be open to private donations. Farnsworth Group guys said companies, corporations, donors won’t give for maintenance, but will donate a shelter, benches, etc. things that are visible. Farnsworth Group suggested anchors to start and end the path, like Illinois College/YMCA to MacMurray College. The end points can expand later to Wal-Mart and west (connect to bike route down Massey Lane, Airport Road and to Lake Jacksonville) and to Foreman Grove and east to North East side of town. Brittany Henry of the Jacksonville Visitors and Conventions Bureau gave some ideas for places in town for a path to connect to. The designers suggest that you tie in connections to the Town Brook path, to places like downtown square, schools like Washington, and historical sights like the Grierson Home. A path could go north/east from Foreman Grove on the east side of town, east side of Mauvaisterre Creek; to the Pioneer Heritage Park and then over the old State Street crossing (removed) with a pedestrian bridge; head west back into town hitting the Grierson Home; and back into downtown square and reconnect to the path via the Main Street connection. Jacksonville Main Street interested in the connecting downtown square and businesses to traffic on the Town brook path at the Main Street crossing. Farnsworth Group previously presented scenic overlook drawings, and this would be the spot to really play up the brook. Put in a rock wall bank, nice trail, pretty flowers. Maybe even close the Mauvaisterre Street East/West off Main and turn that area into a wide spot in the creek, with a little dam to make a pool, water fountain or other water feature. Outdoor nature classrooms, for use by colleges or by grade schools or junior high. Can add other amenities like open spaces, sand lot baseball, ice rink, restrooms, shelter, places to grill out. MacMurray is tearing down Blackstock Hall, in floodplain on south campus. Will be part of a green space that community can use. Mac is interested in having the Town Brook path go right through campus. Farnsworth Group was happy to get this info, because they didn’t know if they had to work around the campus. Illinois College representatives were also excited about the project, and would love to connect both campuses via a bike trail. Something like this would give recreational opportunities for students, faculty, staff and tie the community into the campus. The Town Brook would also beautify the south side of campus, and welcome people to the college. Adjacent Property Owners – mentioned above. Landowners from Fayette Court and West Chambers attended. Said people have walked along the Town brook for years, and enjoyed it, acts as a short cut to Morton Avenue. People use the Town Brook now, just not officially. Interested in adding trees, making area nicer. Added benefits of clearing up flow to reduce flooding. Farnsworth Group said in other communities along a bike path neighboring properties could get a $5,000 boost in property values. Helpful for resale. Plus in new developments that include paths, lots directly adjacent to the path sell first and have higher value. The Woods Lane Mountain Bikers were not able to come (they all had to work the snow) but Steve represented them. They’ve build a great system of trails off Woods Lane around Lake Mauvaisterre. They would like to see a bike path that connect the Town Brook path to their bike network, then on to Lake Jacksonville and a new mountain biking network. They also offered manpower to work along the Town Brook. Other cyclists (road) have said the Town Brook path can be a safe way to get cyclists out of town where they ride low-traffic country roads. A Town Brook path would help the creation of a bike path to Lake Jacksonville. General Public – due to snowstorm, no members of the general public came. Farnsworth Group engineer and landscape architect talked to WLDS radio reporter, then headed home. Timeframe on Brook — some things can start soon, like planting trees and putting in wildflowers. Can have project in different phases. But to transform the whole stream might take 20 years or more. Suggestion was made to include windmills or other alternative energy generation on the parkway as a demonstration project. Bruce Brown said this could be part of the lighting on Town Brook. Said there’s LED lighting system with poles 12-15 foot off the ground, no underground cables, with devices to capture solar and wind energy. Important not to do ground-level lighting, which can create dark spots and require more lighting than an overhead system. Some spots might have emergency call boxes (like the blue-light stations on Illinois College campus). Improve health of stream, give place for fish. Re-meander in spots, riparian areas. Connect to Jacksonville history, connection to Underground Railroad, freed slaves would move into city along Town Brook and later be taken to Underground Railroad homes for safe keeping. Plant prairie, mix of native wildflowers and grasses that would grow to about waist high. Would need to prairie smoke management every three years to control invasive and protect prairie. Dry prairie. Decking — have flat areas with access to water in Town Brook. You can put up a temporary ice rink on a spot of grass along creek (about $5,000 for walls etc to make rink). Harkens back to historic Ashelby Pond near current County Market where people would skate, ice would be cut out and stored in an ice house for use in ice boxes, plus city later used pond as a water source for municipal water supply. Kayak Water Park — no whitewater in town, but there’s some pretty deep pools in Mauvaisterre Creek on the east side of town. Check out the waterway at the closed State Street crossing sometime (east side of creek, by the Pioneer Heritage Park). Tomorrow 1-7 pm (Thursday, February 21, 2013) is the Jacksonville Town Brook Improvement Project Community Input Day at the Jacksonville Area Chamber of Commerce (meeting room). Farnsworth Group, Inc. will be meeting with the public to get community input on proposed plans for the Town Brook. These sessions are designed to collect information from all interested parties. Schedule . . .
We’re going to have a meeting to kick around ideas and try to find more people who support the concept of a park along the Town Brook here in Jacksonville. Come on out at 7 pm Wednesday April 18th at the meeting room downstairs at the Jacksonville Public Library. We’re looking to boost community interest in the Town Brook, and in a bike path out to Lake Jacksonville. We’re also looking for volunteers, civic organizations and resources to help in a proposed cleanup day. If you can’t come and you would still like to help in the future email us and we’ll add you to our contact list or call Steve Warmowski 217.245.4178. The city already owns and maintains most of the land adjoining the creek from Hardin to Lincoln. Would be nice to try to have people be able to use the land as a walking path. Long term the community can add property and potentially expand and link all the way out to Massey Lane and Wal-Mart. We can dream! There’s also a plan somewhere in some desk at Morgan County for a bike route to Lake Jacksonville, would be great to push that idea along as well.